11-11-11 OPENING THE PORTALS | Watchman - Declare What You See! In Albert Pike’s Morals and Dogma, the so-called “Masonic Bible”, Pike explains what occultists view as the Father, Mother, and Son of the trinity, clearly defines who they are, and also what they represent in the “spiritual realm” of the supernatural satanic world of the occult. As Christians, we clearly see this “trinity” as bringing forth the Beast System along with giving birth to and the rise to power of the man we often refer to as the Beast or the Antichrist! “Now the Egyptians arranged their deities in Triads–the FATHER or the Spirit or Active Principle or Generative Power; the MOTHER, or Matter, or the Passive Principle, or the Conceptive Power; and the SON, Issue or Product, the Universe, proceeding from the two principles. These were OSIRIS, ISIS, and HORUS. In the same way, PLATO gives us Thought the Father; Primitive Matter the Mother; and Kosmos the World, the Son, the Universe animated by a soul. Triads of the same kind are found in the Kabalah. From the very first article in this series of articles, my contention has been that America was established to be Satan’s counterfeit of the nation of Israel which brought forth the Messiah. Futhermore, that Satan’s New Israel would give birth to the Beast, the Son of Perdition found in the Book of Revelation, as the False Messiah – Satan’s counterfeit and imitation of the real Messiah, the Lord Jesus Christ! Can this be verified by historical facts and documentation? Well, the following information that I’m about to reveal, in my opinion, not only confirms this analysis, but seals firmly in stone the answer to that question! Isis is the Universal Goddess from which all other goddesses and goddess worship has descended or taken form, and we’ll see exactly how this was designed and formed in this nation – America. Is Isis about to be awakened to give birth to the Beast of the Last Days? There appears to be no doubt about that very thing happening as we approach the opening of the world’s Major Portal (Doorway) deep into the the Bottomless Pit of Hell itself! The birth of Isis in America can be examined by looking at the history of Washington, D.C.. As Satan’s imitation of the “Virgin Mary” in the birth of Christ, Isis as the “mother” cannot be dismissed. 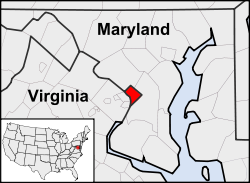 Maryland and Virginia were the two States from which the District of Columbia (District of Isis) was formed. “The New World Virgin Goddess Columbia was just a new manifestation of the ancient consort and virgin mother of god. Depicted in Christianity as theVirgin Mary,Columbia was created out of Virginia and Maryland. To the Masons, the Square is the female aspect. 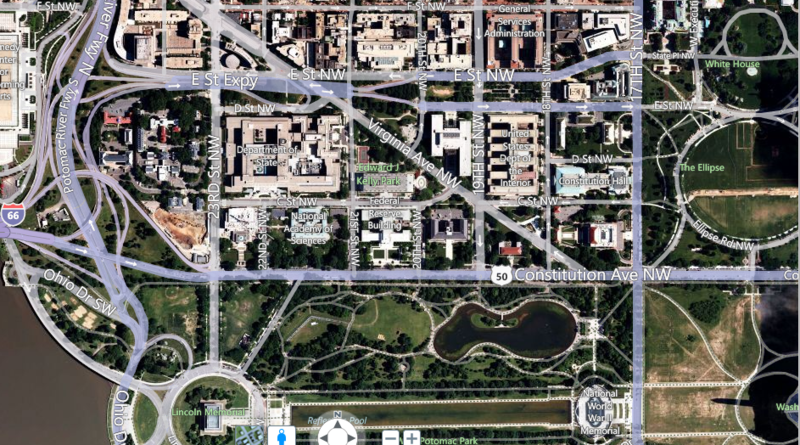 Washington’s original plan for D.C. was a large square with the future Washington Monument (male symbol, compass) at the center. In Egypt the trinity consists of Isis, Osiris, and Horus the son. Isis can be seen as the ultimate female deity. The Congress of Isis and Osiris just so happens to happen above… Congress. “Historians recognize that the beginning of the new independent Republic occurred on July 4, 1776, when the Declaration of Independence was publicly issued. We already know that the timing of this declaration was carefully calculated according to Satanic doctrine. July 4 is exactly the 66th day following the beginning of the Satanic High Holy period called Beltane, which begins on April 30. In this calculation, April 30 is counted as ‘Day 1’. Interstate 66 leads straight into the heart of Washington, D. C. For more on the number 66, please review Part I of The Lucifer Project – Raising Antichrist under the sub-topic heading of Sixty-Six and Idol Worship. Texe Marrs made the following comments in his excellent book entiled, Codex Magica. The forming of Satan’s counterfeit “Virgin Mary” which was designed to give birth to the soon coming False Messiah. 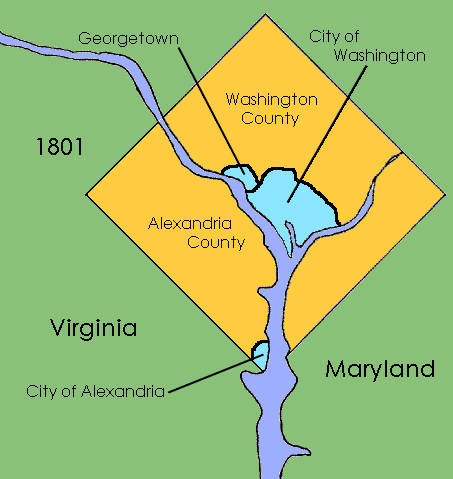 Out of Virgin – ia and Mary – land was formed the District of Columbia (ISIS)! Virginia is often called “The Mother of Presidents”, but its destiny appears to play a major part in the forming of the Unholy Womb of Isis along with Maryland to bring in the birth of the coming Antichrist! Continuing on with the number thirteen (13) and the “spiritual meaning” of “rebellion” associated with it, consider the following building which sits at 1300 Pennsylvania Avenue in Washington, D.C. right beside the Federal Triangle. “The Ronald Reagan Building and International Trade Center, named after former United States President Ronald Reagan, is the first federal building in Washington, D.C. designed for both governmental and private sector purposes. 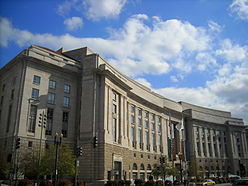 In 1987, the U.S. Congress passed the Federal Triangle Development Act, authorizing a Federal building complex and international cultural and trade center to complete the redevelopment of Pennsylvania Avenue. There is no doubt where all these symbols first originated, nor as to the meaning of each symbol. The coming “birth” of the son (Horus), the Son of Perdition, has been on the horizon and in Satan’s plan to counterfeit the Messiah for thousands of years! “The Eye of Providence (or the all-seeing eye of God) is a symbol showing an eye often surrounded by rays of light or a glory and usually enclosed by a triangle. It is sometimes interpreted as representing the eye of God watching over humankind (or divine providence). Is there a “spiritual connection” between the number 111 and the date of 9/11? Beginning with the day after 9/11 there are exactly 111 days left to the end of the year. Is this some kind of Satanic “time-piece” that is foretelling the end-the-age? While we have previously looked at the number of 111 in previous articles, there is much more resident in the number than first glance as you’ll soon discover. Osiris was the “sun god”, and his son Horus (Antichrist) is the one that is to be “birthed” into the world via the Womb of Isis! 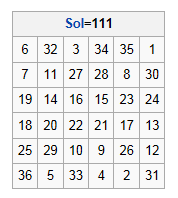 It is certainly most appropriate that the magic square of Sol, the sun, is made up of rows of numbers that add to 111 in every direction. This Magic Square is a talisman that is calling for the “birth” of Horus, and the total of all the numbers add to 666 which is the name, the number, and the Mark of the Beast! The following web site, unknowingly, reveals how Satan and his followers have used this magic square to call into “being” the False Messiah, a fake Jesus, using the same numerical value of Jesus in Greek gematria – the assigning of numbers to letters in the Greek language. If you remember previously, the number 666 and 222 are not numbers associated with the true Messiah, Jesus Christ, but with the coming Beast and his kingdom. Six, six, six (666) is the name, the number, and the Mark of the Beast, while two, two, two (222) is the numerical value of Hell in English gematria! The numbers two added together DO NOT represent Christ, but the False Christ destined to soon come upon the world and his kingdom! All the “ducks” have been placed in a row by a “supernatural being” named Satan, the “god of this world”, to usher in his last-day kingdom before the return of Christ to establish His Millennial Reign. Many dispute that a 112th Pope was in the original list of the Pope Prophecy, and I feel that they may well be correct. Due to the “lateness of the hour” and the “signs of the times”, I personally believe that the next “Pope” will most likely be the “Pope of the World” of which Scripture calls the False Prophet! With things concerning the fulfillment of Bible prophecy moving at the “speed of light”, we will not have to tarry long before all these things start falling into place right in front of those with “eyes to see”! The 111th Congress of the United States of America ran from 1/3/2009 to 1/3/2011. During this time frame of Congress Barack Obama was sworn into office TWICE, once publicly and once in a private ceremony! Then, ObamaCare was passed during the time that the 111th Congress was in session complete with the “micro-chip implant” provision as was revealed in a previous article on ObamaCare. From the day that ObamaCare was signed into law to July 11th 2010 was 111 days. From July 11th of 2009, Obama’s first year in office as President, until, 12/21/2012, is 1260 days, the number of days that the Antichrist will reign. Was this an “omen” of things to come? What’s so unique about the year 2011 other than the floods, earthquakes, wildfires, famines, droughts, volcanic eruptions, extreme heat, fish dying, bees dying, and flocks of birds dying for unexplainable reasons? Take a look at the following video to discover what else is unique about this year in light of everything else that been revealed in this blog, the news media, and the Scriptures. The number, 111, has its “mark” upon all humanity in the year 2011! Since we’ve already covered the number 33 and its meaning in much detail as the number associated with the coming False Messiah, I won’t repeat all that again. However, I do want to point out that Walmart’s new Trade-Mark also is representative of the number 33, and the “what’s above is like what’s below” slogan and belief of the Luciferian occultists, often referred to as the Illuminati, is found within the Trade-Mark as well. Three sections on top and three sections on the bottom make up the Trade-Mark and form the number 33. How can 11-11-11 and 666 be represented in the same numerical rendering? Take a look at the following video to understand how that can be accomplished. Not only has the number, 666, been with us for years in the bar codes on products, but so has 11-11-11! Does anyone hear a Doorway into the abyss (bottomless pit) squeaking open just a little? To the NewAger, crystals can be used as a “healing source” in addition to other esoteric uses, and are used extensively in Wicca/Witchcraft. Crystals are also used in industry in many different forms and aspects. The Electronic Industry in only one of many that use crystals extensively. “Crystal Bridges Museum of American Art is a museum of American art currently under construction in Bentonville, Arkansas. The museum is planning to officially open November 11, 2011. In looking at the Walmart Trade-Mark and the new Crystal Bridges Museum of American Art set to open on 11-11-11, it appears that WalMart and its heirs are set on building CRYSTAL BRIDGES TO THE FUTURE! If you haven’t discovered by now the “spiritual implications” associated with all of this now happening, then I suggest you start over at the beginning of this blog and read everything once or twice again! “The United states government agency that helped invent the Internet now wants to do the same for travel to the stars. Yes, the movie which portrays the “return of the gods” and a “superman” who will save us is going to be released on 11-11-11! Is this not how Satan will position the “man of sin”! While we’ve already looked at the Age of Aquarius in a previous article, there are some things that need to be uncovered here as well. 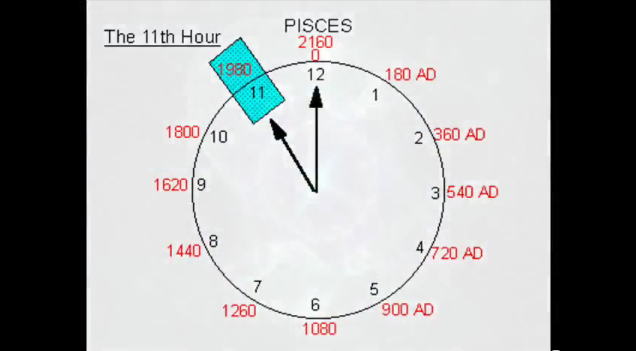 According to the following video, the 11th Hour began in the year of 1980, the very year that Ronald Wilson Reagan, born under the sign of Aquarius, was first elected President of the United States! Would anyone believe that most all of the towns and cities in America are laid out on a 666 Magic Square Grid! All this right under our nose, and very few people are even aware that such a thing exists! Now, here’s an actual surveyor’s discovery of this very fact, and his reaction to his discovery. Who’s responsible for the land of the towns and cities of America in a 666 Magic Square Grid? 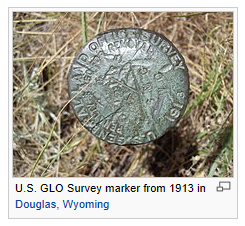 “The General Land Office (GLO) was an independent agency of the United States government responsible for public domain lands in the United States. It was created in 1812 to take over functions previously conducted by the United States Department of the Treasury. Since the New Testament was written Greek which assigned a numerical value to each letter, almost everyone who’s studied Bible prophecy knows that the numerical value of Jesus in the Greek is 888. Since Satan plans to offer his counterfeit “messiah” to the world, then he most likely would do so with someone who’s name or the numbers associated with him, or both, would add to 888 in the Sumerian Code (English Gematria) since that’s world’s standard language. Consider the following, knowing that Reagan’s street number at his place of birth was 111, and the number associated with the Real Messiah, Jesus, is 888! “Ouroboros is associated with Alchemy, Gnosticism and Hermeticism. It represents the cyclical nature of things, eternal return, and other things perceived as cycles that begin anew as soon as they end. The White House in Washington, D. C. sits at 1600 Pennsylvania Avenue, while the street address of Reagan’s birth was 111. 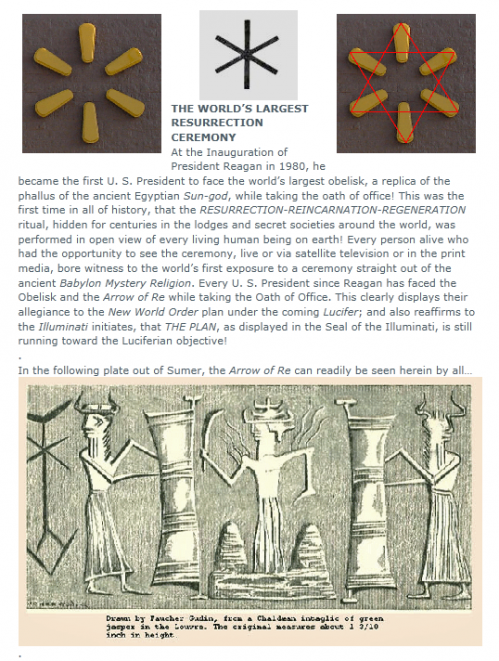 What does this have to do with Satan’s plan for a New World Order under the Son of Perdition? America’s founding date was July 4, 1776, and 16(00) x 111 = 1776! The zeros are not numbers, and would not be utilized in this occultist numerology designed by the “god of this world”. The baby Jesus was born under the “Star of Bethlehem”, from the womb of a virgin named Mary, within probably a normal gestation period of 9 months or so, while the Son of Perdition will be born from the womb of Isis under the “Star of Isis” that appears over the District of Columbia (Isis). What about the 9 month or so period of gestation that Mary endured for the real Messiah? Well, from the death of Reagan to the most likely time for the Son of Perdition to arrive, sometime in the first half of the year, 2013, will be exactly 9 years to the year! In case some readers have forgotten the Biblical basis for this “birth” or “return” of a former World Leader in “spirit form”, then you might want to read the following verses as a refresher. 2And the people shall take them, and bring them to their place: and the house of Israel shall possess them in the land of the LORD for servants and handmaids: and they shall take them captives, whose captives they were; and they shall rule over their oppressors. 4That thou shalt take up this proverb against the king of Babylon, and say, How hath the oppressor ceased! the golden city ceased! 5The LORD hath broken the staff of the wicked, and the sceptre of the rulers. 6He who smote the people in wrath with a continual stroke, he that ruled the nations in anger, is persecuted, and none hindereth. 8Yea, the fir trees rejoice at thee, and the cedars of Lebanon, saying, Since thou art laid down, no feller is come up against us. 9Hell from beneath is moved for thee to meet thee at thy coming: it stirreth up the dead for thee, even all the chief ones of the earth; it hath raised up from their thrones all the kings of the nations. 26This is the purpose that is purposed upon the whole earth: and this is the hand that is stretched out upon all the nations. 27For the LORD of hosts hath purposed, and who shall disannul it? and his hand is stretched out, and who shall turn it back? Satan has never been in a “grave” to be cast out of, but the “spirits” of several world leaders most assuredly reside there! That’s just one major reason that Lucifer is not Satan! However, like Judas, Satan will enter into him and he will then become the Son of Perdition just as Judas did after Satan entered into him. There are only two people in all of Scripture that are called the Son of Perdition, they are Judas and the soon coming “man of sin”! So good to see your new article here, Watchman. God is good. I will read it as I can, as my daughter was in the hospital last week….things are a bit topsy-turvy. Will continue to pray for your safety, and of your loved ones. The watchmen and women are targets of the enemy of God and of our souls. Looking forward to read what you have to tell us. Thank you Phyllis! I’m so sorry to hear about your daughter being in the hospital. My prayers are with you both during this time of addtional stress in your life. Thank you so much for your prayers! Watchman, would you please help me find the article with the Obama Care/microchip? The article can be found at: https://watchman33.wordpress.com/2009/08/30/swine-flu-shot-the-mark-of-the-beast/. I was referring to your reference and insight on the microchip. I do not recall it being mentioned in other articles you have written, and want to re-read it. I apologize if I was confusing. Thanks so much. My old brain is on overload lately. Thank you for the prayers for my family. So appreciated. Thank you very much Ross! I was looking over your surveyor’s report again. He is vague on any of the Founding Fathers being connected with the Township/Magic Square connection. I was listening to the History channel last night, and many of our founding fathers were surveyors. I believe Thomas Jefferson, Ben Franklin, George Washington. Any connection with the “magic square” of townships? He did mention Ben Franklin liking secret societies, but did not connect him or Jefferson to Illuminati. Yet, as I understand it, all of these men had Illuminati and Masonic connections. Is this a connection with the actual establishing of the magic square/township design? You all might want to take this piece of information into consideration reguarding watchmans 11:11 post. Let’s just say, we are not being told the truth from The Powers That Be. Take it to the lord Jesus in prayer for discernment. Hello there, I discovered your site by the use of Google at the same time as looking for a similar matter, your website came up, it seems great. I have bookmarked it in my google bookmarks.